The 21st edition of SICUR 2018, the most important Spanish Trade Fair for the security sector, is going to open its doors. At this Fair, which will take place from 20th to 23rd February, our Spanish distributor SGSE is showcasing all our PIDS: at its booth (10B04) visitors will find functioning demo equipment for the underfloor SISMA CA system, for the SERIR P2P fence-mounted system and for the new indoor XENSITY system. The Spanish market is one of the most important for DEA: our systems have been trading here for more than ten years and they have been employing in residential and commercial sites, in banking institutions, in power plants and nuclear power plants, in military sites and gas deposits. 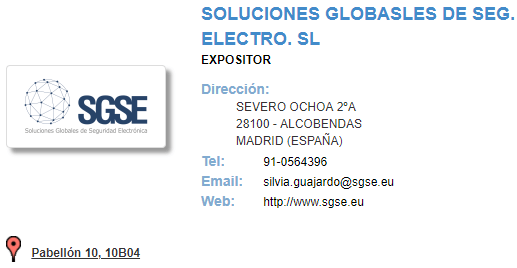 SGSE is our exclusive distributor for Spain and can provide professionals with technical advice and support.